South African-engineered and manufactured sailing blocks will be available for sale to yacht enthusiasts soon. This is the second batch of the products that is being produced, with the first batch having been used as test pieces or fitted onto yachts through personal contact sales. 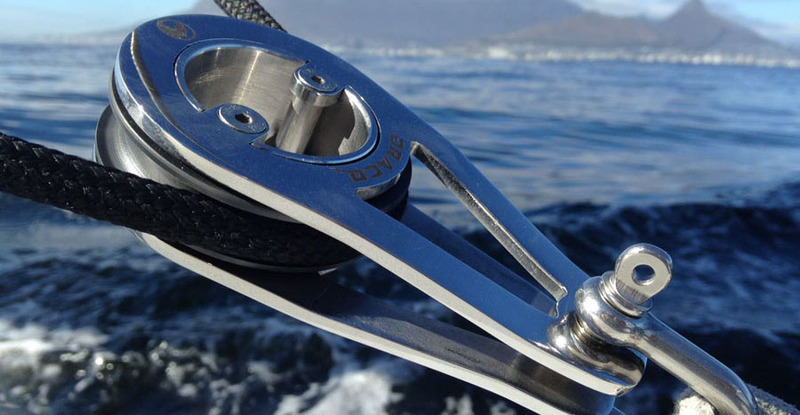 “We waited until we were completely satisfied with the performance of the first range before actively marketing the products,” says Draco Sailing Hardware mechanical engineer Scheepers Schoeman. Schoeman explains that sailing blocks are part of the rigging system that operates the running rigging, or the ropes, of a yacht. “It is very important that sailing blocks are strong, reliable and serviceable. If the blocks do not perform adequately, the control of the sails are affected. Additionally, a catastrophic block failure can damage expensive larger equipment. For this reason, we designed our equipment to handle very high loads, while managing to keep the weight low,” comments Schoeman. The blocks have undergone a multistage load test at an official lifting machine inspector. The blocks have been certified for their maximum working load and designed breaking load, with all blocks having met or exceeded design parameters. The metal parts of the block have also undergone an accelerated electrolysis corrosion test to ensure that the products withstand long-term marine conditions. South African-manufactured Vesconite is also included in the sailing block design. “Vesconite is ideal for our application,” enthuses Schoeman. “We need a very strong, wear-resistant, low-friction, ultraviolet-stable engineered plastic that is also dimensionally stable in water. Even more than that, we want to prove that we can beat the imported parts, not only on price, but also on performance with a completely local product. Vesconite ticks all of our boxes,” says Schoeman.